Cape Wrath from Balnakeil beach, Durness. We Visited family on the north coast of Scotland for a long weekend. You feel like your at the edge of the world up there. The beaches are stunning, backdropped with mountains, and the landscape feels like the ice sheet retreated only yesterday, littering the views with morains. 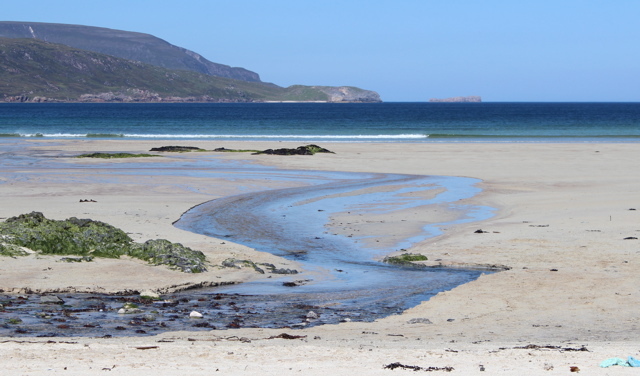 The Navy and Air Force use the little island in the photo for bombing practice, and Cape Wrath is aptly named, either battered by the North sea or the military. Some of the oldest rocks in the world live here, Lewisian Gneisses and Moines, the area is a Geo-park – a playground for geologists. When you work with stone you acquire a working interest in rocks, but these are not stones I come across in my carving life. My geology is pretty sketchy, but I enjoy dipping into the subject. The wilderness is not far away here. It is rich in wildlife and weather. It is hard to get to, but once your here It is a great place for taking pictures. This entry was posted in photography and tagged durness, landscape, photography, scotland by iaincotton. Bookmark the permalink. I have always loved water – either a fresh water stream or tidewaters – flowing across a sandy beach like that. It is such a dynamic enviroment. Thanks Bill. The whole landscape is full of drama there. Like I said, a great place to take pictures. I need to get my head around flickr so I can share more pictures more easily.